Attach the Wide Aluminum Carabiner with Key Ring to belts, bags, and backpacks and always have your keys handy. 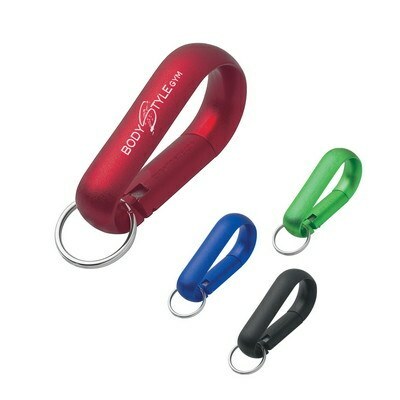 Imprint your company’s logo on the carabiner to effectively advertise your brand. Attach the Wide Aluminum Carabiner with Key Ring to belts, bags, and backpacks and always have your keys handy. Imprint your company’s logo on the carabiner to effectively advertise your brand. The carabiner comes with a convenient split ring attachment. It is available in blue, black, green, and red colors. This is one of the best promo items that does not add clutter to your customers’ busy lifestyles. Give away the cost effective product at trade fairs and community events, to elevate your brand’s success.